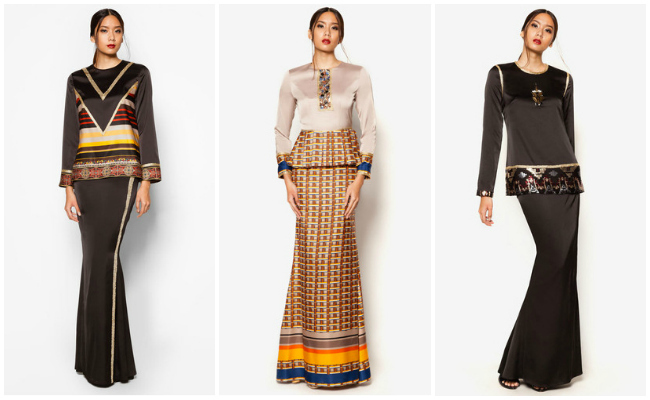 ZALORA Women's Muslim Wear for Raya 2016! There's only few days left till Ramadhan . Less than a month, is it? Can't believe how time flies and next after Ramadhan, it's Raya timeee! Weeee *joget zapin* . For me, Raya is not only about rendang, lemang, sate and all those weight-gaining Raya menus , but the best part is that we get to dressed as pretty as we can! No one would jeling at you wearing all glamorous baju kurung with rambu ramba here and there walking down the street cause people know "eh it's raya lah! Sure lah wear cantik cantik right? " Since Raya is approaching , people start to get busy with Raya preparation. For those who love their baju raya to be tailored, they already booked theirs since Raya cina hahaha awalnya! But not mehhh (me) . I always love doing last minute raya shopping cause I often like "ala it's still early" "ala later lah" "ala just wait for the price to dropped". And then, when Raya is just around the corner, I will start to 'gelabah' looking for my baju raya and here's where the "alaaa takde size" "alaaa xcantik" "alaaa takde warna I nak" drama will start . To cut all the dramas and fuss and pissed off for the why-lah-takde-parking issue , I think this is the time where I need to start to shop my baju raya in a more easy and modern way instead . Many of us know what Zalora is, what Zalora offers and we sure know that everything there are stunning. (Cantikk all the designer pieces are to die for!) Thus, why susah susah looking for baju raya in the middle of crowded bazaar or carnival when we can wait for it to be delivered right infront of our door. Easy right? No sweating sweating , no pushing pushing , no walking walking. Pufffecctt for someone like me who is so malas to move hahahaha . As I can see now, there's a lots of ongoing fashion show and launching of new collection from the well-known designers and clothing labels specially for raya edition. It is obvious that everyone was so excited about Raya (including me!). Same like the previous years, raya collections from Jovian, Rizalman, Melinda Looi and Hatta Dolmat were the most awaiting for and I must say everyyyyyoneeeee had fell head over heels for all these designer's collections! Their collection are not only high quality but also unique and rare (in a gorgeus way I must say) . Definitely worth the price tag hihiks. I've always wanted one but never got the chances to pick one. T___T . I should and I got to have one this year!! Hand's up Jovianistas! Here's something classy and exquisite for you guys. 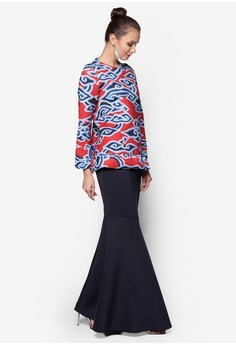 I love how this modern kurung present the inner classiccity of the wearer . You'll look like a queen wearing this. This remind me of Queen Diana and the queen of Perak, Tuanku Zara. There's no raya if no Rizalman, hehe . Such a big name in this fashion industry, you sure know him lah kan? And of course, no doubt for each and every piece Rizalman made. Gorgeous - nuff said! And oohh , I heard that Rizalman are currently working on producing a short film starring a line of Malaysian's famous artists. I wonder what film is that? Please tell me it's a fashion - all - glamorous- bling - here- bling-there movies. Just so that I can cuci mata looking at the dresses. hahaha. I'm so look forward to it! Fiziwoo is often known for it's unique and "you can't found anywhere" kinda design. Just look at his new collection for this raya, modern kurung with such a dramatic collar. Sadly I can't wear this, or my tudung will cover all that kepuk kepuk (wavy) collar, rugilah!haha . You guys should check out his full collection at Zalora . All - pretty-i'll-start-puasa-now-so-i-can-buy-one-for-raya collection, I must say teheeee. By time I'm writing this, I already added some into my cart mehmehmeh. Let's see which one survive to the checkout. You should start looking for your baju raya too, before all you favorite pieces and sizes are gone. Where to shop? ZALORA lahhh . Syabas MBO Melaka Mall | Isu tandas, resolved! Yeay Johor Cuti Hari ni!